Vogue Holiday–10 1/2–My favorite size needle! – Love.Yarn.Shop. Vogue Holiday–10 1/2–My favorite size needle! The 2015 Holiday issue of Vogue Knitting has plenty to offer, but the best section, for my taste, are the six patterns knit with bulky yarn on 10 1/2 –or larger–size needles. The cropped poncho with diminishing cables and rolled collar would look great on anyone, any age. My personal favorite is the open seed-stitch, short-sleeved cardigan, but the tunic with a lattice pattern has my name on it, also. Nothing like an excuse to wear leggings in winter. You’ll find several beaded shawls, a tunic, gloves, and wristlets in the section “The Bead Goes On.” Special knits for special occasions this winter. I’m all about reds and “Drama Queens” has some yummy cowls and shawls knit in rich crimsons and pinks to warm you up for the holidays. 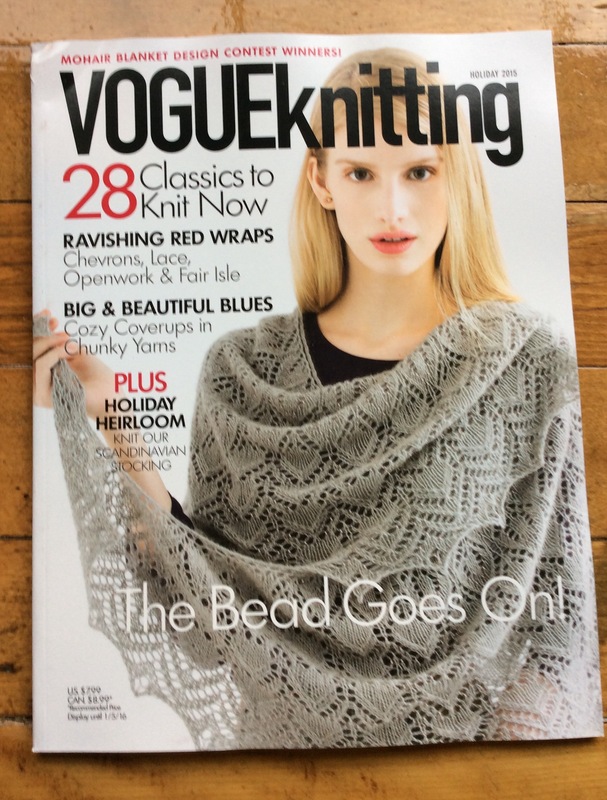 If you think Vogue Knitting is full of difficult and esoteric patterns, it’s time to look again. At $7.99, you can’t beat the variety of patterns found inside their covers. There is something for every knitter.